February 2018: What Will Fulfill You? When Will You Feel Complete? December 2017: Wanting a Perfect Christmas? Anxious or Excited?.. August 2017: Has your Life Got Momentum ??! Not Enough or Too Much? July 2017: Building Resilience… Struggling with something? … It’s not all your Fault! May 2017: Life In Gear and On Track or Do you Feel Exhausted and Getting Nowhere? April 2017: Aware of any Coincidences Recently? Happen to be in the Right Place at the Right Time? March 2017: We Live in a Multi-Dimensional Reality… What does that mean? February 2017: Love… Do you know that you Attract All your Experiences like a Huge Magnet? November 2016: Centred with Inner Peace or Chasing Your Tail? September 2016: Do You Have a Healthy Core? July 2016: Mind or Body in Charge? Are You? Are You your Mind? Are You your Body? June 2016: Ever Feel You Can’t Move Forward in your Life? Feel Clamped? May 2016: Does your Life Reflect your Worth? … What is ‘Worth’? Just Money? Or a Feeling? April 2016: Lost Your Spark? March 2016: Sensory Perception… Do you like how you see the World? February 2016: Does your Life have a Pulse? Do you Feel Alive? January 2016: It’s a New Year – Fresh Start? New Enthusiasm? December 2015: Does Christmas Feel Empty? Want it to Feel More Meaningful? November 2015: Do you Believe in Angels? October 2015: Is your Life Hard-wired? Are you fed up with “That’s just the way it is”?! September 2015: What is Your Life’s Bigger Picture? July 2015: Mind vs Heart – Thoughts vs Feelings… Do you know the difference? June 2015: Feeling stuck? Trying hard to change things but without success? May 2015: Relationship Issues? Maybe it’s Your Conflicting YIN & YANG?! Apr 2015: What Does Your LIFE MAP look like for This Year? Mar 2015: What is TRUTH? What is REALITY? What is ILLUSION? Jan 2015: We All Have Addictions?… What’s Yours? Dec 2014: Can Love Be Unconditional? Nov 2014: All Systems Go! Oct 2014: EMPOWERED? How strong do you feel on the inside? Sept 2014: Did you get Nominated for the ALS “#icebucketchallenge“ ? July 2014: Are you Led by your Heart or your Mind? Your Soul or your Spirit? Something Else? May 2014: In Harmony with your Life? Feel In or Out of Sync? April 2014: Spinning Too Many Plates? 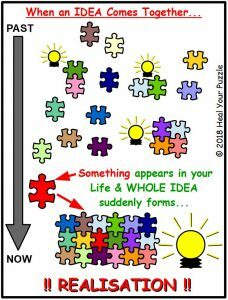 Mar 2014: Does your Puzzle Fit Together? Feb 2014: Stepping Outside your Comfort Zone? Exhilarated or Frightened? Nov 2013: How Conscious are You? Do you want to be more Conscious? What does that mean? Oct 2013: Systems vs. Networks… Do You Recognise the Part You Play? July 2013: Do You Have Keys for Your Spiritual Doors? June 2013: Frustrated by your Healing Journey? April 2013: What is Karma? Feb 2013: Looking for New Opportunity? New Job? New Love? Dec 2012: Your ‘A to B’ for 2013 – How much do you want to Achieve or Heal? Oct 2012: What do you really, really want? What’s your Heart’s Intention? 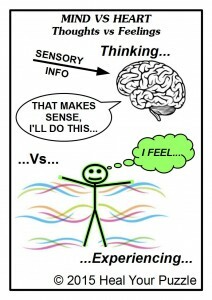 Aug 2012: Have you heard of “The Ascension Process”? April 2012: What is a Fractal? And what has it got to do with Healing? Jan 2012: It’s 2012 and what does this mean for you? Sept 2011: Who Wants to Heal Themselves? Mind vs Heart – Thoughts vs Feelings… Do you know the difference? This time last year (July 2014), I asked a similar question funnily enough! ?… “Are you Led by your Heart or your Mind?” and concluded then that at the end of the day, when thinking really has not given you the answers and the feelings are confusing, just ask yourself, YOU, “What do I really want to do?” Since then I have pondered on what actually are ‘feelings’ in terms of healing and subtle energies. I thought I knew enough and as usual I find there is more to the story! Feelings appear to be not just another behaviour we have alongside thinking, they seem to be the backdrop to all the thinking that we do; they influence how we think, how we make decisions and how we behave. Our Mind deciphers all our sensory information, creates a form that we can understand, decides a strategy to follow and a response happens. When we cannot find clarity, decide on a strategy or a response, it will usually be because a feeling is confusing this process or overriding logical thought. Another mechanism is at work, another mechanism which is far more than just learned behaviour or strategies; you are experiencing your Self, experiencing an underlying Truth about who you are and what drives you, you are experiencing the Heart of who you are. We are all individuals; we are all unique. Some of us are driven more by our feelings than logical process; some are driven by logic rather than feelings. In my experience to date, to fully connect however with who you are and to experience an authentic, colourful, meaningful life requires the Mind and Heart to grow in themselves and together and be able to function in harmony, to comfortably be able to decipher the energy of each other and work together. Relationship Issues? Maybe it’s Your Conflicting YIN & YANG?! Much of my healing work is about relationships, not just between men and women but also between ideas we have about the world and about ourselves. Ill health or relationship difficulties can arise when our beliefs, understandings, thoughts and/or feelings do not agree or how they relate is unclear. 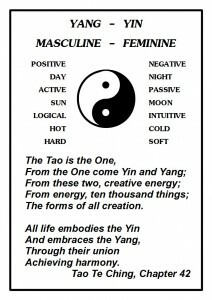 The idea of Yin and Yang is described beautifully in the Tao Te Ching (insert), ancient Classic Chinese Writings dating back to the 6th Century BC, which underpin many ideas in various Eastern Philosophies and have also become very popular in our own culture. Today is a new day! Many will seize this day. Many will live it to the fullest. Refer to the Healing Guidance given on this website for how to interact with this Space.